To search for items on the 1st Boer War, use the the subject heading "Transvaal (South Africa) -- History -- War of 1880-1881". To search for items on the 2nd Boer War, use the the subject heading "South African War 1899-1902". 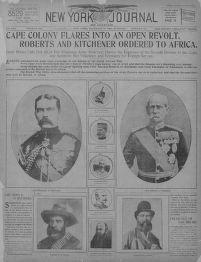 This LibGuide is for students researching the 2nd Boer War. To see a list of all items in the USMA Library with subject headings relating to the "South African War 1899-1902"
To see a list of all items in ConnectNY with subject headings relating to the "South African War 1899-1902"
Each semester, instructors place books on reserve for certain courses. During the Fall of 2016, the following books are on reserve for DS 302. You'll find these books in the Reserve Room, on the 4th floor of the Library. Most books cannot be borrowed - they are to remain in the Reserve Room for all to use. If you have questions, please see a member of the Library staff.